This dish is easy to make, and it's delicious! I bought a Kitchenaid Pasta Press, and I have been experimenting with a variety of recipes. This one is a keeper! I added Aleppo pepper at the end for a bit of heat. A good quality olive oil is a must for this recipe. I use extra virgin olive oil from California Olive Ranch. For this recipe, I used the mild and buttery profile. I buy a wedge of pecorino romano and grate it myself. 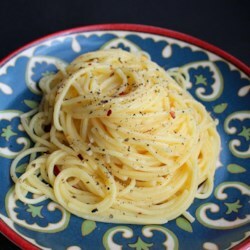 The recipe is really good with store bought spaghetti, but fresh spaghetti takes it over the top!